Macaws are undervalued seed dispersers in tropical landscapes, according to new research. (Inside Science) -- Ten thousand years ago in what is now Bolivia, giant sloths, ancient elephants and behemoth armadillos inadvertently helped cultivate today’s tropical forests by carrying seeds to suitable habitats. These prehistoric seed distributors are long gone, but researchers claim that modern macaws have adopted this vital dispersing task. Macaws’ seed-spreading role was long overlooked, but new evidence shows just how critical the birds can be to forest health. Seed dispersal is important “because plants don’t have feet” said Taal Levi, a fisheries and wildlife professor at Oregon State University. Seeds that settle too close to their parents or siblings compete for resources and are more vulnerable to species-specific predation and disease. To avoid these dangers, plants have many ways to scatter their seeds. In the tropics, up to 70 percent of all tree species rely on vertebrates to ferry their offspring away. Naturalists usually think of tapirs, monkeys and livestock -- mammals who ingest fruit and later defecate healthy seeds – as the primary distributors of large seeds in tropical habitats. Macaws, on the other hand, are believed to be detrimental to seed success, as they often destroy the seeds they eat and thus lower the proportion of viable plant offspring. But research from the last few years challenges these beliefs, claiming that macaws are also capable of dispersing large seeds. A new study published this month in Scientific Reports adds more evidence to this new view, finding that three macaw species are influential seed dispersers for one of the primary tree species in a tropical habitat in Northern Bolivia called the Beni savanna. The Beni savanna hosts grassy fields that surround pockets of dense tree groves known as forest islands. The most dominant forest island tree is the motacú palm, which serves as a food resource and a nesting site for local fauna. Nearby communities also value the tree as a source of roof material and cooking oil. To determine the most active palm seed dispersers in the Beni savanna, a Bolivian and Spanish research team compared palm fruit foraging habits between species. They tracked macaws, monkeys and cattle during the day, searched for nocturnal mammals by flashlight and used cameras to record the palm trees’ more elusive diners. The researchers found that three types of macaws (the blue-throated, the chestnut-fronted, and the blue-and-yellow macaw) were the most common motacú palm dispersers. 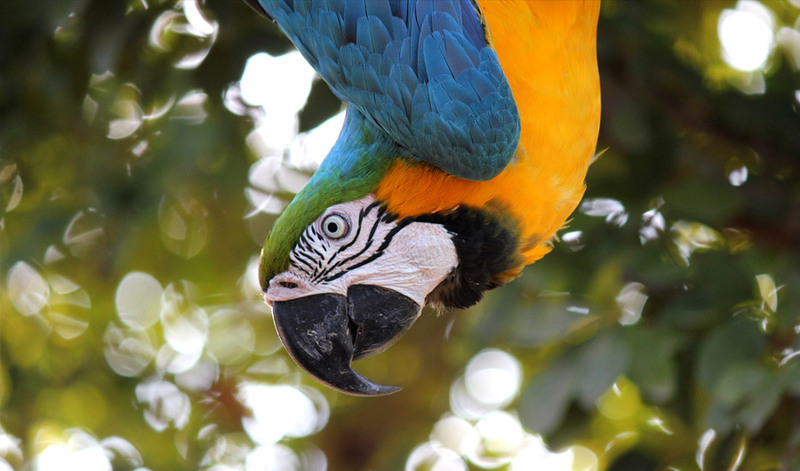 Compared to cattle, the next most prevalent seed distributors, the three macaw species together discarded nearly three times as many motacú seeds per hour. Monkeys, rodents and other birds made very few seed-carrying contributions in comparison. Contrary to their reputation as seed eaters, these macaws pluck the palm fruit, fly to a different tree to eat the fleshy pulp, then drop the cleaned seed below. Still, birds that eat pulp, also known as pulp thieves, are often not effective dispersers. “People generally think that pulp thieves are not as important because they are usually dropping the seeds close to where they found it,” said Levi, who was not involved in the study. However, macaws have an especially hard time perching on the motacú palm, so they instead eat the palm fruit on a more stable tree. The macaws usually carried seeds about 30-50 meters away from parent trees, but some birds traveled more than half a mile with motacú seeds in tow. The researchers suggest that the variety in seed dispersal distance provides two benefits. Dropping seeds within or close to the confines of the forest island contributes to forest regeneration. “Forest islands are dynamic systems in which, for their correct functioning, new trees are required to replace those who die,” said Adrián Baños Villalaba, a doctoral candidate at the University Pablo de Olavide in Spain and lead author for the study, in an email to Inside Science. Carrying seeds longer distances to other forest islands establishes more genetic connections between tree groves. This kind of dispersal event improves the palm population’s ability to bounce back from disturbances. If one grove of motacú palms were wiped out, for example, the other motacú forest groves would live on, and their seeds, with the help of macaws, could replenish the diminished forest island. Seed dispersers aren’t all created equal, and some animals drop seeds in better habitats than others. To study how different species likely affect motacú palm seed success, the scientists recorded how often juvenile palms were found near macaw perching trees and cattle paths. They documented 981 immature palms across 12.2 hectares of the Beni savanna, about the same size as 24 football fields. From their spatial analysis, the researchers determined they were more likely to come across a young palm as they got closer to a perching tree. Conversely, their probability of finding a palm decreased with proximity to cattle paths. They expect that this kind of terrain is prone to trampled down soil and hungry cows. Besides highlighting the overlooked ecological role macaws have in their ecosystem, the researchers believe their findings give more reason to preserve macaw species. While the blue-and-yellow macaw and the chestnut-fronted macaw are not considered endangered, as of 2014 there were only 300-400 blue-throated macaws left on Earth. This species has experienced significant population decline over the last few decades due to poaching. This kind of decline may come with serious consequences. One 2016 study predicts that as seed disperser populations recede in overhunted Amazonian forests, those forests will consequently lose carbon-storing biomass. Seed dispersers like macaws help keep forests healthy. The new research suggests that threats to such species not only put unique animals at risk, but may place an entire ecosystem in jeopardy.